Other home features deemed “essential” by a large share of these new aristocrats include hot tubs, at 45 percent; commercial-grade kitchen appliances, at 52 percent; and multiple-view security cameras, at 54 percent. Proximity to good restaurants was the most important community amenity in the survey results -- followed by proximity to family. 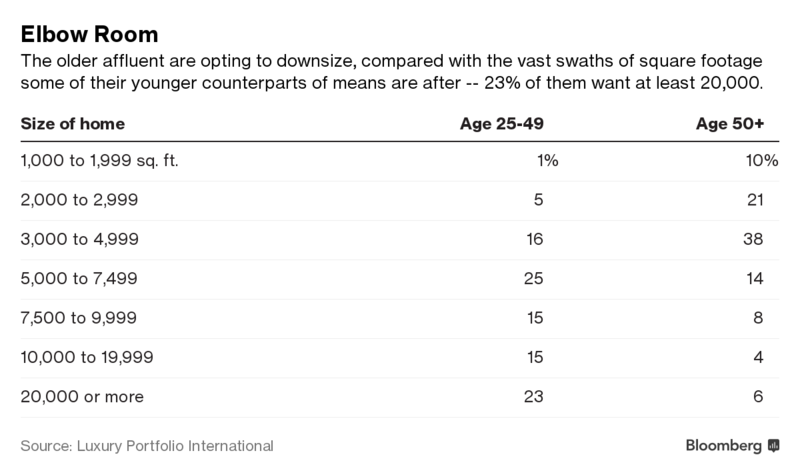 Three of five respondents under 50 said they expect to inherit at least $1 million, with an average inheritance of $3.8 million. Thanks to a tax provision passed under George W. Bush, a lot of that wealth is available sooner to today’s heirs. More than 171,000 families gave gifts of at least $1 million between 2011 and 2014, according to the report, a giant leap from about 7,600 families who made $1 million gifts between 2007 and 2010. Another boost will come from the new tax law, which cuts taxes on the rich, and a booming stock market that is translating into demand for luxury homes.